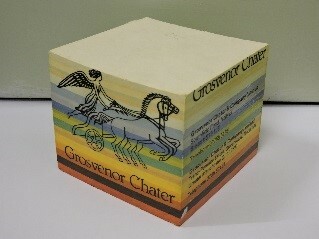 Block of coloured note paper stamped with Grosvenor Chater. Lab scales for measuring chemicals. 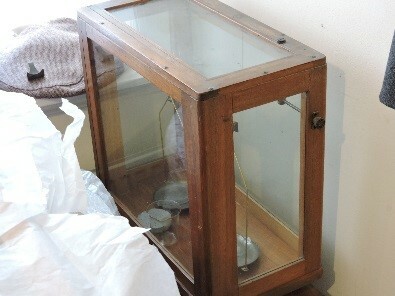 Used by Hugh Rutt, the paper mill manager in his experiments. The paper mill was established around 1821 and was taken over by the prestigious Grosvenor Chater Company of London in 1854. It was located on the site of the current Greenfield Business Park where some of the original buildings are still standing. It was the largest Paper mill in Wales at the time and produced high quality writing paper from Esparto Grass imported from North Africa. The constant water supply and proximity of the Mostyn and Greenfield Docks made the site ideal. Papermaking continued until 1982 when the factory closed. The museum holds a collection of photographs of the factory and production methods, as well as the workers doing their daily duties. There are photographs of the construction of Basingwerk House which belonged to the manager of the mill from the 1930s. The manager Hugh Rutt and his family lived at the house for many years and it now functions as the Trust offices. Hugh was very enthusiastic about his work and attentive to his workers and he left a collection of books relating to paper production and methods, as well as office furniture and lab equipment. There are also samples of the numerous colours and styles of writing paper produced at the mill which all hold the Abbey Paper Mill watermark of quality.